Home/Spotlight/Competitor Spotlight – Paul Kelly – Racing to Make a Difference! 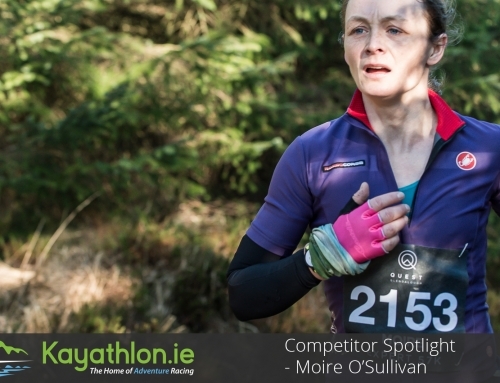 This weeks Competitor Spotlight is a little different than our usual spotlight. 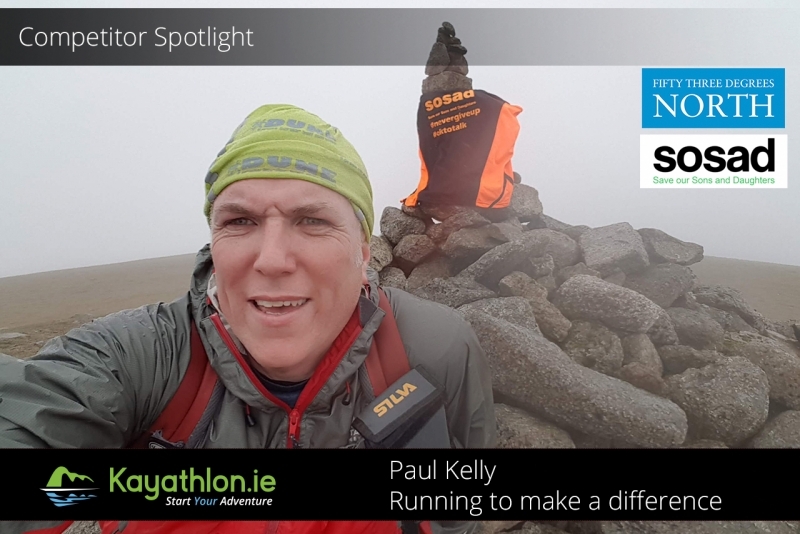 Paul Kelly, a relative newcomer to the Adventure Racing scene, took up running only 4 years and has come a long way since those first faithful steps. The work he is doing simply cannot go unnoticed. It’s a subject that sadly is coming more and more common place and I believe by bringing this to the fore, it can only be of benefit to everyone who takes the time to read it. Wow! I’d say you have seen some interesting/funny things along the way. Care to share? There would a couple of stories over the years with comical twists, would not be right to share publically. However I do recall a good few years ago doing a jig at a wildfire incident when a rodent took refuge in the safety of the inside my over trousers clawing into me at the top of my boots, felt like my leg was being ripped open only to find a scared mouse. I’m not quite fully committed to Adventure Racing just yet. I started running a little over 4yrs ago; everyone who runs does so for a reason that is personal to them, for me I was looking for headspace and a way of relieving stress in general. I didn’t really take it too seriously at first, just pounded the roads until I could do no more… which really didn’t take very long. I have tried to commit to running in the last 3yrs when I can. From believing I had a decent level of fitness through my work, I quickly realised how unfit I actually was because I had to walk 9 times the first time I tried to run 5km. I’ll never forget it… It was at night after 12hr shift and I was pretty wound up, I laced up and hit the road full of confidence, not even 1km in and I felt like I had been punched in the guts. Disgusted with myself, I pushed on, determined to cover the distance as quick as I could… It was very difficult I but I did it, and that gave me something to focus on. Following the first couple of 5km races, pushing myself for that quicker time and that illusive PR, I realized that as difficult as it was starting out, I wanted more from this. To do that I would need to challenge myself. I found the more I put myself under a bit of pressure to train for that next race, the more I found it easier to clear my head. I’m not exactly sure how many I’ve done in the last 4yrs… This year I’m in for 14 with just four to go. 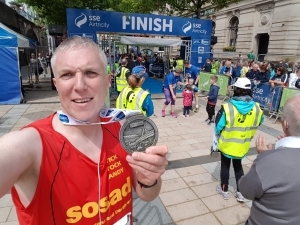 For the past two years I’ve been running specifically to help raise awareness, and money, for a local suicide prevention charity SOSAD. I can say that I’ve gone from a shady first attempt at 5km distance in 2013 to Dublin City Marathon in 2016. I wanted to take part in the Year of Centenaries. I wanted that particular medal since I can’t wait another 100yrs for the next one! My adventures along the way have ranged through 5km, 10km, Half Marathon, ¾ Marathon to Full Marathon. Not a big deal to most as it was only 5km distance, however it was my first hurdle and it felt like a mountain. I honestly thought I was going to bust a lung, I pushed that hard. I remember the adrenaline high immediately after it when I realised I got in under 29mins. It was brilliant. I went on and entered into the first Dublin Fire Brigade charity 5km road race with BHAA gaining me a much better 20:24 finish time. I still have yet to get my sub 20min. 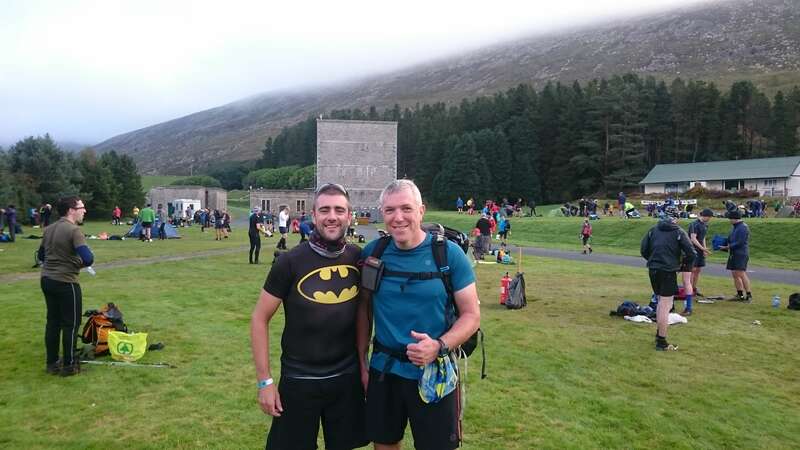 My first adventure race was a small kayak / run challenge for charity that took place in scenic Carlingford in May 2016 to raise funds for Temple Street Children’s Hospital. 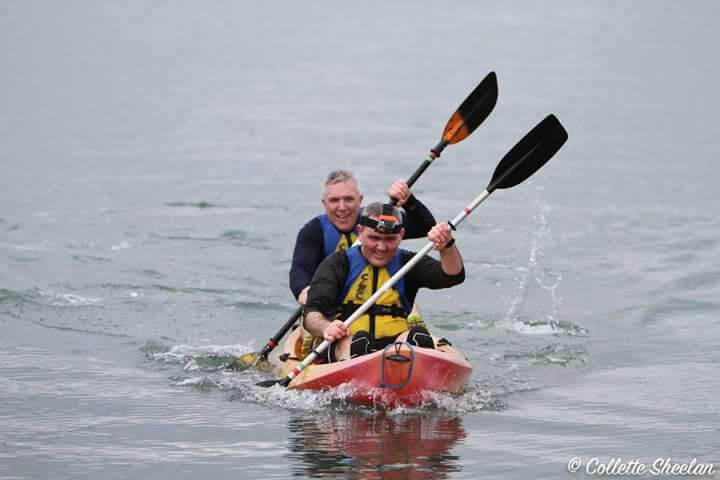 The race was teams of two (my brother in-law Frank Agnew and myself) which started with a quick kayak around the harbour and a run halfway out the Greenway towards Omeath and back, to finish with another lap of the harbour in the kayak. I have kayaked for a number of years so I knew it would be a bit of craic! 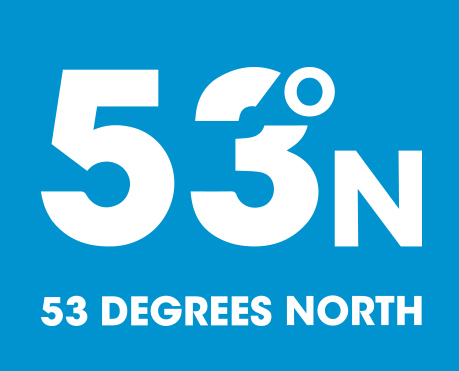 It was the North East Runners (NER) Patsy Kelly 5km (PK5k). 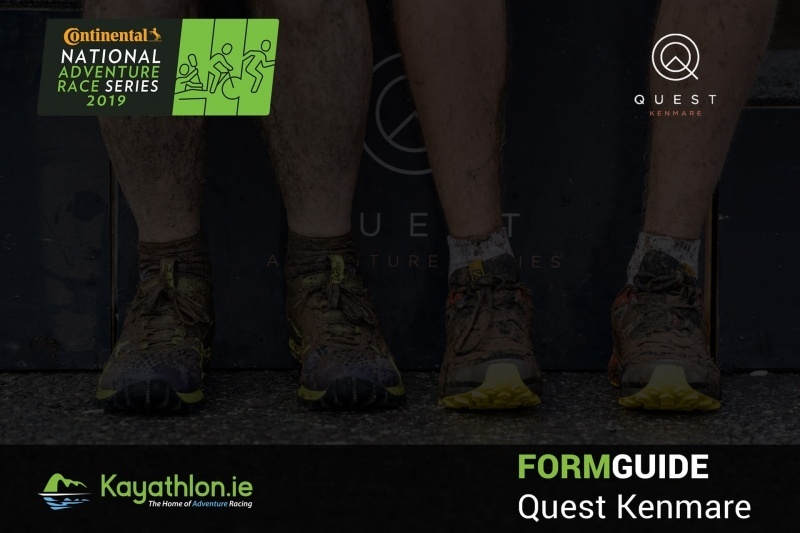 It’s a very well organised and structured event on what has become renowned as a fast-paced course with something for everyone, no matter their ability. I’m just having fun. There’s a lot out there I have yet to enter and multi-discipline events are looking like the way to go. 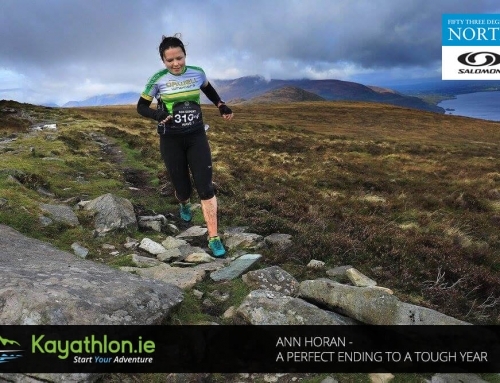 Both the Dune Half Marathon from Newry to Dundalk and the South Armagh Twin Peaks Half are great and challenging events. The Mourne2Day has to be the main goal for now, as it can be relentless or rewarding depending on the effort you put in. 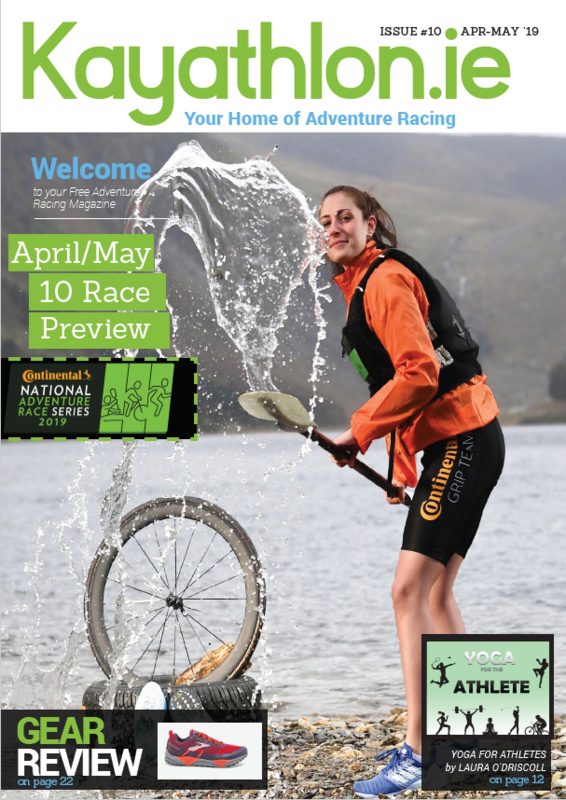 Anything on the adventure racing calendar for next year. Thinking of the Coast to Coast as a possibility. I think it is the challenge of entering, preparing and competing in a race, along with the sense of achievement when I cross the finish line. 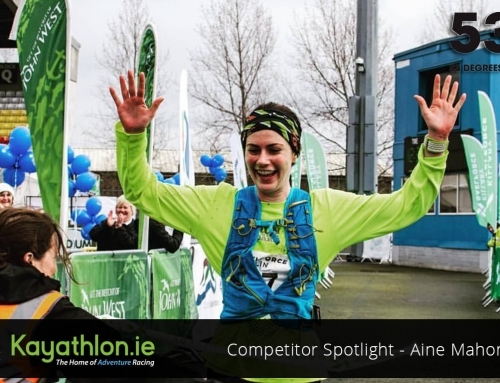 The achievements of some of my running friends have inspired me to go further distances, like Siobhan Ladd Greer who took up running in her retirement and now represents Ireland in Triathlons. I entered the Mourne2Day Mountain Marathon in Sept 2016, just to get a bigger taste for adventure trail running. 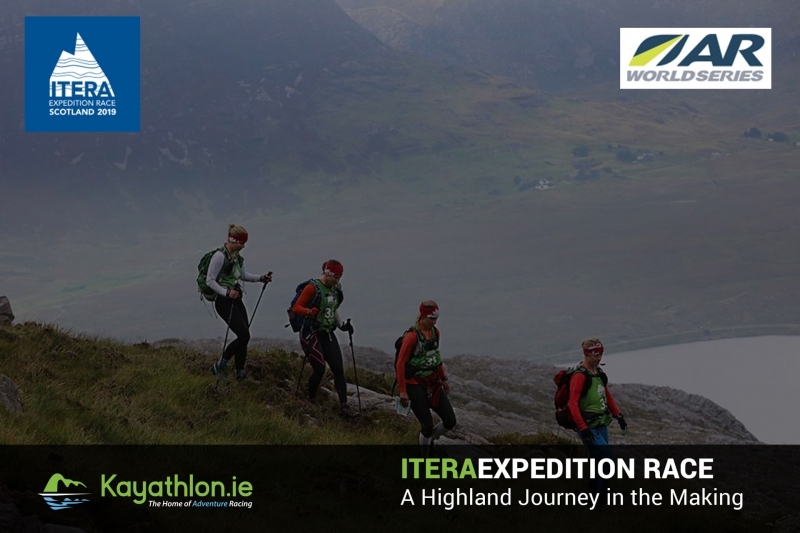 This is a marathon distance over two days in the Mournes, carrying everything you need to survive 36hrs on the mountain including tent and food. 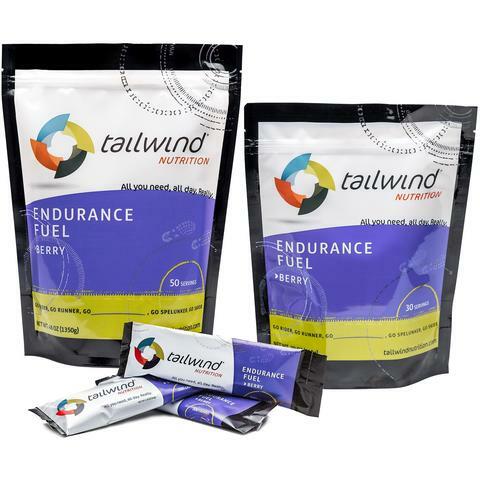 This not only tests your fitness but navigation by map and compass and nutrition. 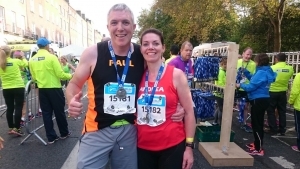 I ran that (crawled in places) with my good friend and also an inspiration – Dave Gowan. The plan is to better our performance in this year’s event, learning from our mistakes last year. However, we did make history in last year’s race by being the first team to stop and make a brew at the ½ way timed checkpoint… apparently everyone takes these events very seriously! 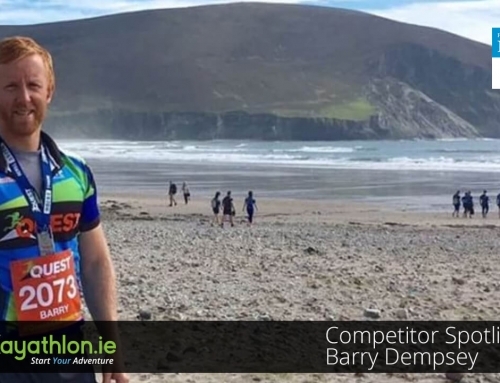 So far this year I’ve completed the Dune Half Marathon, Fitzers 5km, Carlingford Half Marathon, NER PK5K, MSR Mourne Mountain Run, DKIT 10km, Cooley Coast Run 10km (21km warm up run to that), Derry Marathon, South Armagh Twin Peaks Half Marathon Trail. 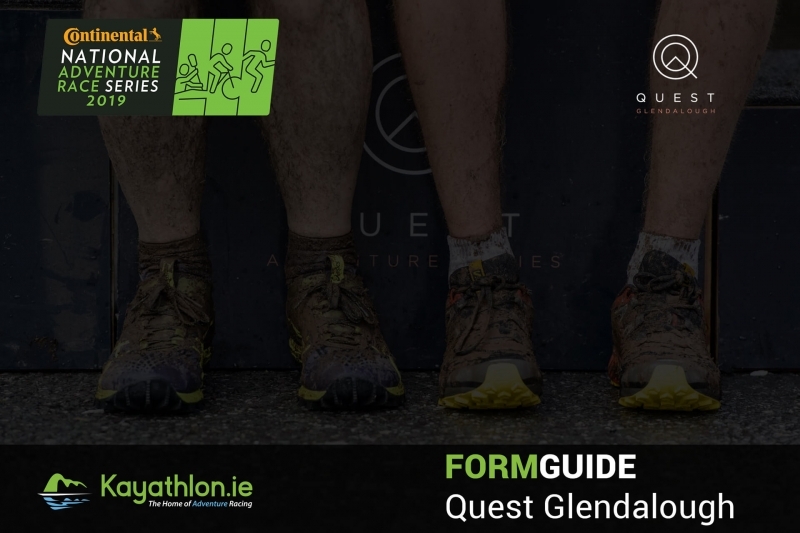 Next is the Mourne2Day Mountain Marathon, SOSAD 5km, Dublin Half Marathon, Dublin Full Marathon. Asics Gel Nimbus 18 for the road and I’ve been hacking out the trails in my Brooks Cascadia (a bit worse for wear at this stage and starting to fall apart). 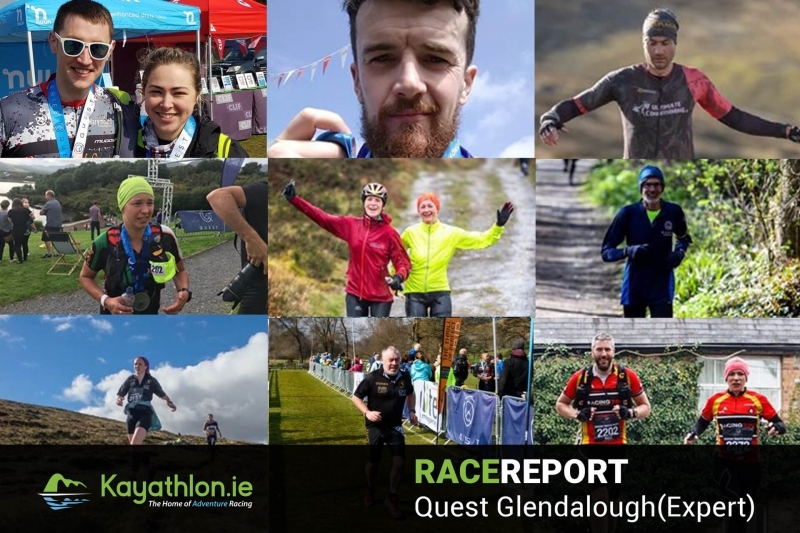 The last harsh run they had was in the Mourne Mountains on a fun-filled trail run with the MSR (Mud Sweat and Runners) group. I don’t ride for events yet… the extent of my cycling is commuting to work on my Cube Ltd Pro. I recently bought a Giant Anyroad 2, which I intend to use competing. The winter training plan is to get ready for adventure racing next year. Tapering is the big thing… to me in my naivety early on I thought this meant doing feck all and giving it a lash on the day… resulting in unnecessary torture! 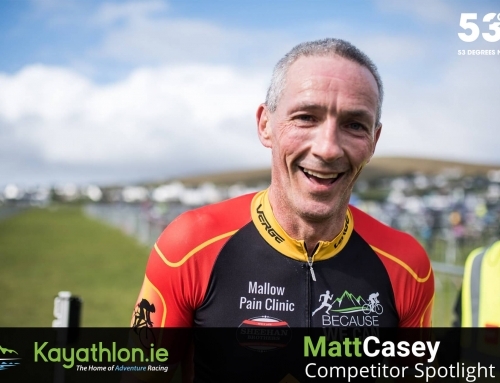 From taking the wrong approach to then accepting experienced people’s advice (and educating myself a bit), my race-week build-up now involves a relaxed approach to exercise and trying to stay on top of hydration and nutrition. (Not always easy and shift work does not always help). I try not to think of the event too much as I don’t want to run it mentally beforehand, I can talk myself into how difficult it will be and create barriers I really don’t need. Race kit having been always laid out the previous night, and the event bag left ready to lift from the night before also, I’ve found myself still at times doing out the bag and repacking so as not to forget anything… Breakfast is usually a good bowl of porridge and some fresh fruit and water. I tend not to drink coffee until after the race. I would have to say a Half Marathon distance for now. Enjoying the longer runs and I’m having fun building up to full Marathon distance, only having completed two marathons I’m not fully comfortable with this distance yet. As I gain more strength and confidence, I definitely want to try my hand at the adventure circuit. On a trip to North Wales recently I climbed Mount Snowdon via Crib Goch Ridge with my brother. As we gingerly treaded our way over Crib, carefully placing every hand and foot (due to the 220 foot drop either side of a ridge no wider than my trail shoes) we were passed by a true mountain goat, this gent was a couple of years older and the speed with which he progressed and climbed after he got past us was unreal by the time, we got off the ridge we found him at the trig point finishing his lunch and enjoying the views. Age is only a number; get out get active, we’re never too old to take on an adventure. The amount of Marathon runners dressing up in all kinds of weird costumes, everything from super heroes to the Eiffel tower… looks like great fun but I would say they are tortured during with the heat and by the weight of their costumes. Definitely has to be the Mourne Mountains for me. People travel abroad for scenery but we have something amazing on our own doorstep. Hydration has to be simply water for me however, after Dublin Marathon last year; I did use Lucozade Sport at times during longer LSR’s. As for Gel’s, I can’t tolerate them. As if the endurance of the effort to keep going was not bad enough sometimes, having to endure a nauseous stomach in addition does not appeal to me. I use CLIF Shot Bloks and bars and find them a hell of a lot more tolerable. A little more expensive and not as readably available though. Do you use a GPS watch? If so, which one? I use the Garmin Vivo active. I find it a great watch and easy to use and instant updates when linked to my phone. Battery is decent also. I wear it all the time now and get a bit of a kick out of the Garmin challenges such as the step challenge and the running group I’m involved with on it. 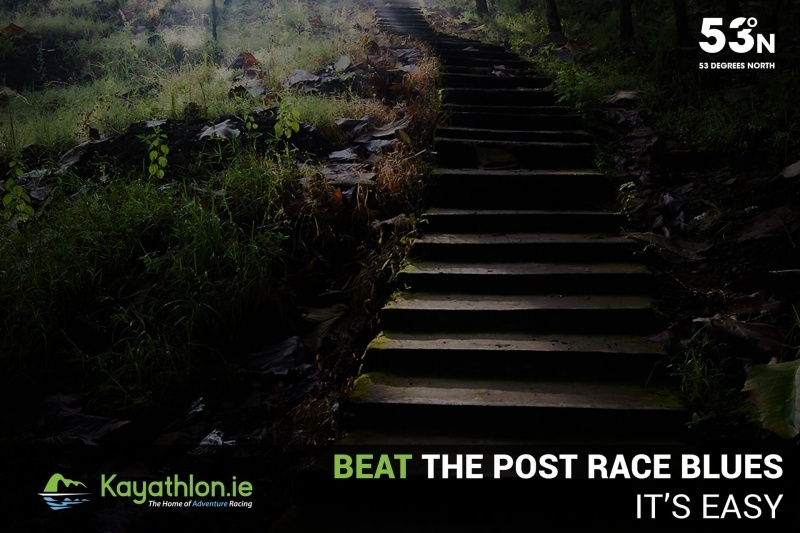 It’s a monthly mileage challenge and the banter is lively on the forum. I also have it linked to my Strava and it updates that account automatically. I would not really say I have a sporting hero. Decide what discipline you want to get started in and promise yourself the commitment to stick it out for whatever period of time, no matter how hard it gets. That is the first step. The second step is to just get out and do it, get moving and have fun, enjoy it and you’ll stick it out. As your strength and fitness builds, you will endure more and want more, that’s the addiction getting started. You have done a lot of work for Suicide Awareness and SOSAD Ireland? SOSAD (Save Our Sons and Daughters) was started in 2009 by Perter Moroney Drogheda Co. Louth after the loss of his son Simon to suicide in May 2003. Peter hoped to offer a support network to others faced with the same pain as his family had suffered. It is the mission of SOSAD Ireland to ensure that anybody needing their help is with a councillor within 7 days of contact. This can be months if people go through the HSE. Suicide prevention and SOSAD became my personal choice of charity through my work as an Officer and Firefighter in Fire and Rescue. A little over two years ago I reached a turning point. I attended a scene with my crew following a suicide. I’ve attended a few over the years, but this one got me thinking and I asked the question, why is this still happening? There are prevention charities like SOSAD with support and information and yet there are people still taking their own lives. Support and information is out there but it’s not always getting to the people who need it most, or at least not in time. In 2015, my brother Dermot in Australia challenged me to the 22 for 22 Press-Up Challenge on Facebook. He was doing it for war vets – the background of that is the sad statistic that 22 vets commit suicide in the USA every week. They weren’t pretty but I did them and had fun changing the location as much as possible, from the summit of Slieve Foy Mountain to the sea wall in Dun Laoghaire. I did my last 22 with Barry Watters, my friend and councillor with SOSAD, and handed the baton to him, so to speak. 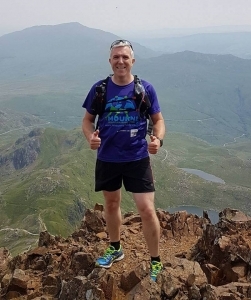 Earlier this year on the 27th of March, I lost a very close friend and running buddy to suicide. This hit the extended family in the running community in the northeast very hard. Even though he encouraged me to keep doing what I do and the support he gave to others, this was still his end. Derry was his race and he convinced me to run it this year for the 1st time, and ran it I did. The wheels came off at the ¾ mark and I fought for every km to cross the line for my friend. It was tough and emotional at the finish line but it was full of joy in his memory for so many who knew him. Is there anyway way we can get more involved? There are a large number of Intervention and Support Services like SOSAD around the country, seek out the ones nearest you and offer a helping hand. Use the service if you need to or just simply give them an hour or two of your time. Sometimes just being a listener is enough to make a difference. Check out www.sosadireland.ie to find out more about the work these guys do. All these services are completely free to the end user and nobody is turned away. If SOSAD cannot help you then they will put you in touch with the right services. I log all my runs and events on Garmin and STRAVA. I tend to post mostly on facebook, Twitter and Instagram. I try to push the charity page through these around race events also. The charity page is running almost like a blog at this stage. I just need to get more folks checking it out to read my story and hopefully donate a few bob through it. Even if someone is not in a position to donate, then I ask them to look up the SOSAD page. This journey is dedicated to my friend Andy Califf and to all who have been lost to suicide.